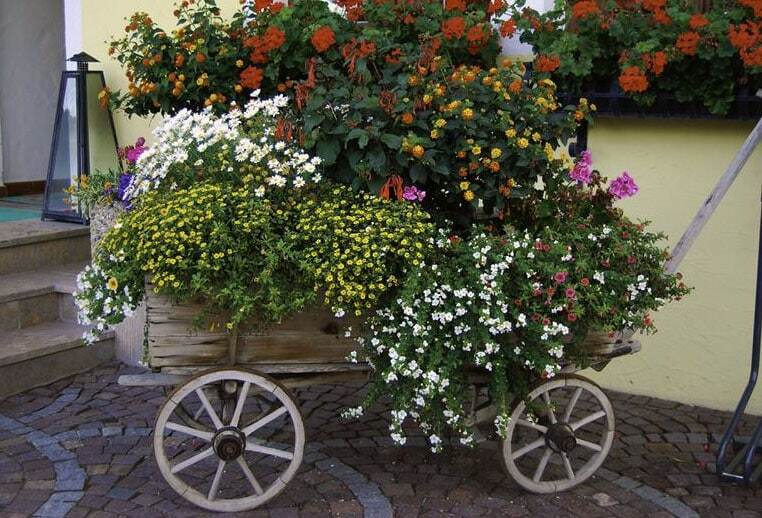 Want to discover beautiful wheelbarrow planter ideas for your own backyard garden? 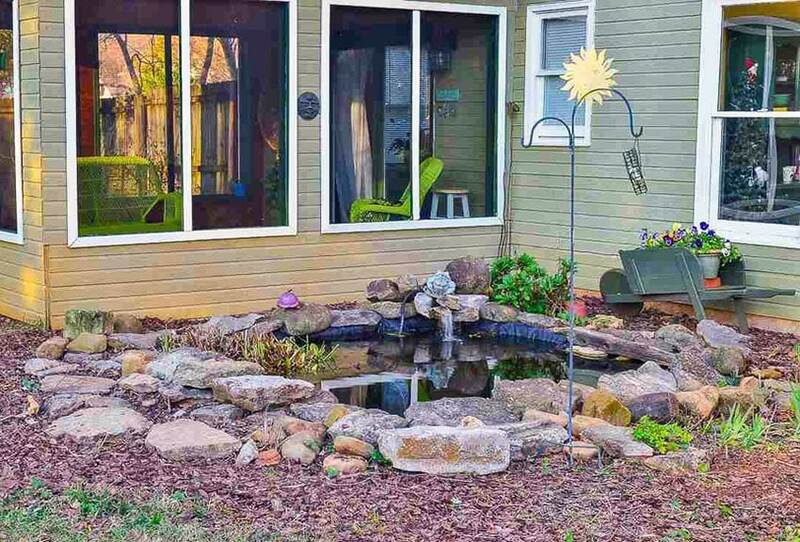 Aside from the usual flowers, plants and shrubs, some gardens have quirky items mixed with the usual landscaping items. Some add unique pots, small water fountains, statues, and some even include old items found in your garage or backyard, such as old wheels, old gardening tools, etc. 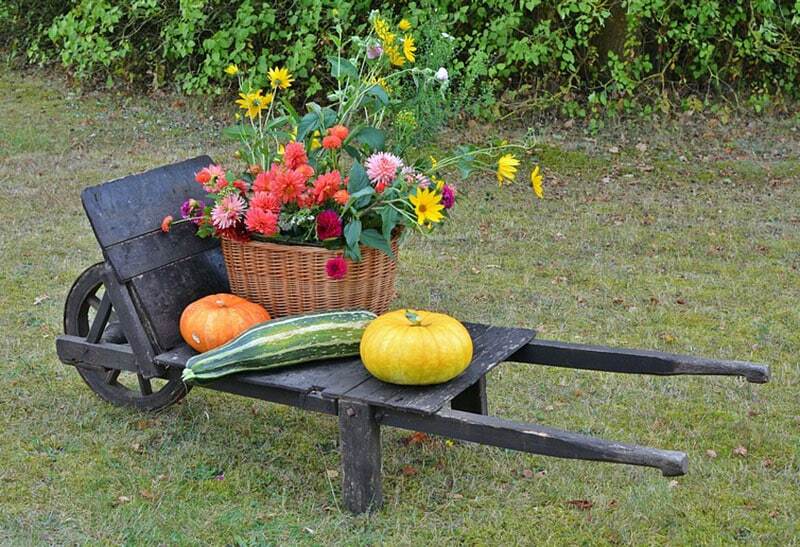 One of the most common of these old backyard items would be the wheelbarrow, which can be converted and re-purposed into a unique plant box. 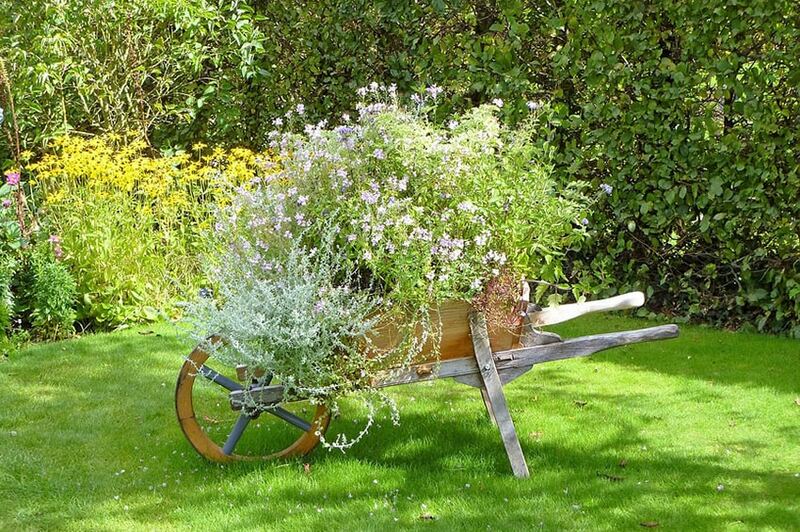 The all-wood wheelbarrow pictured above features a raw wood finish which gives it a very natural and rustic appeal, allowing it to blend in nicely with the variety of plants and flowers placed in and around it. A wheelbarrow is a functional tool that can be used to transport various items on short distances. It usually has one wheel at the front is designed to be propelled by one person using the handles at the opposite end of its singular wheel. Modern wheelbarrows are usually made from metal & a rubber tire or plastic, but older wheel barrows are usually all-wood. Some wheelbarrow designs also combines different materials, but they are generally operated in the same way and are around the same size. Despite its very functional use, there comes a time that a wheelbarrow would deteriorate and loose its primary function to haul items. Just like any tool, eventually, your wheelbarrow would get rusty, deformed or its wheels would break. Instead of disposing your wheelbarrow, however, there are various things you can do with your old wheelbarrow to transform and re-purpose it. 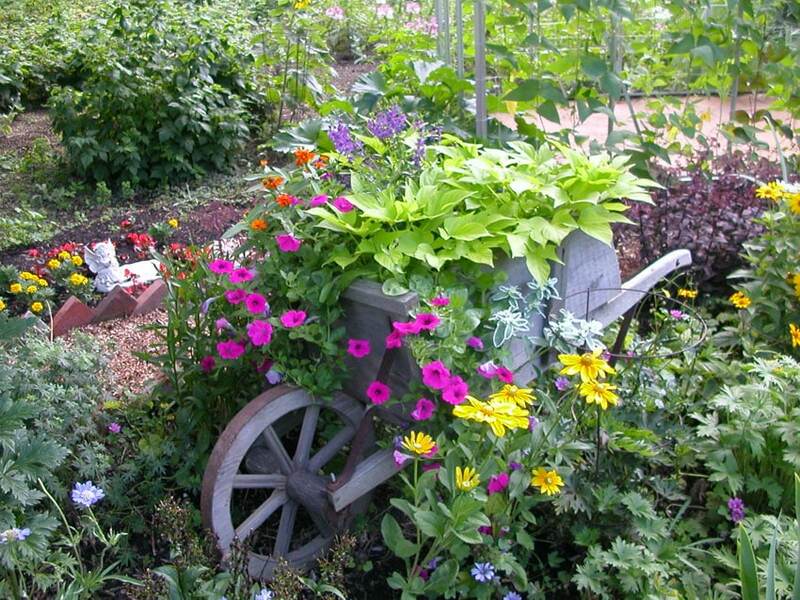 Using an old wheelbarrow as a garden planter can give it new life and add a unique focal point in your garden. 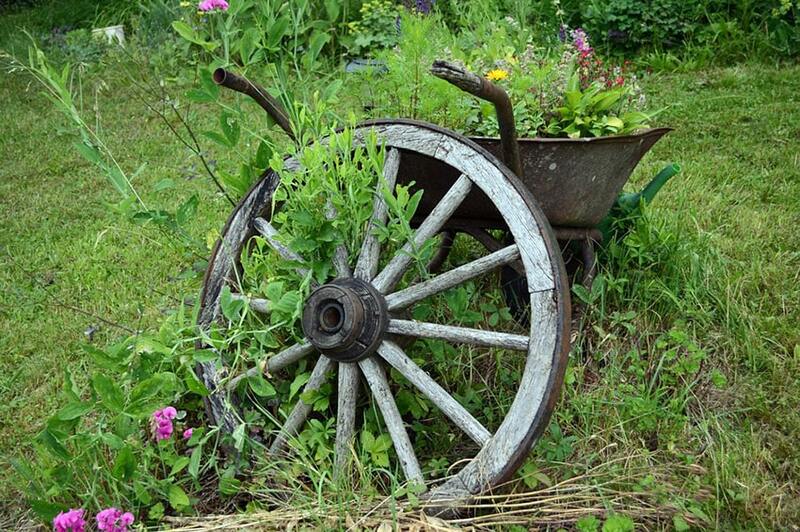 It doesn’t matter how dilapidated your old wheelbarrow is as that can simply add to its charm. With a few simple steps and tools, your old wheelbarrow can be given a new life & become the star of your backyard. Those who have kept their old wheelbarrows would definitely get excited with this idea, but those who don’t can easily source them on junkyards, thrift shops or flea markets for a very low price. Rust and deformity should not discourage you to use old wheelbarrows as such details simply add to its charm and rustic appeal. 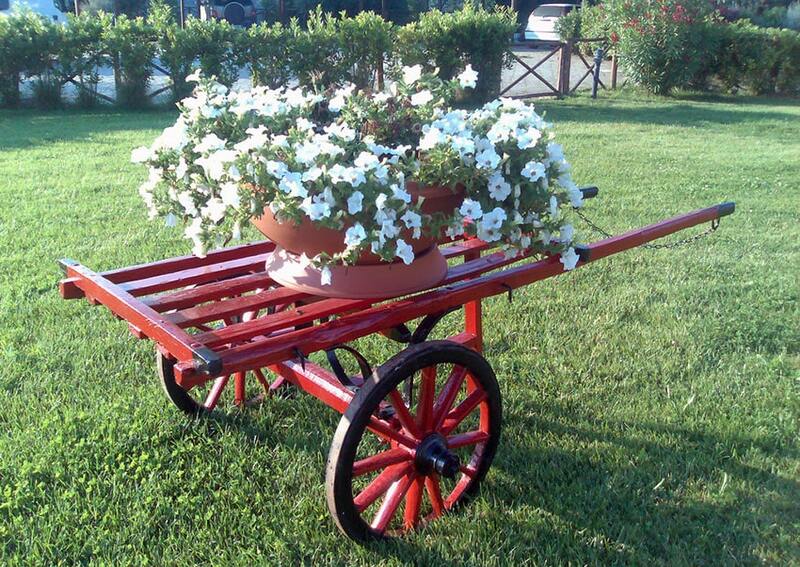 Below are some excellent examples of wheelbarrows which were transformed into wheelbarrow planters. You will see a variety of wheelbarrow planter ideas including a variety of styles, materials and area of application which might inspire you when creating your own. 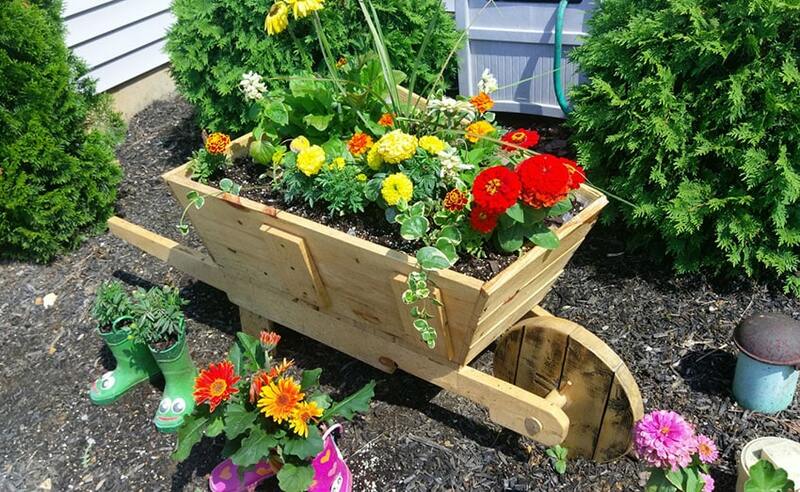 This birch wheelbarrow was re-purposed into a gorgeous flower box. Since the mechanism is still functional, you can easily transfer its location in your garden as well. You can also find other repurposing ideas here, such as the old rain boots used as a flower pot. 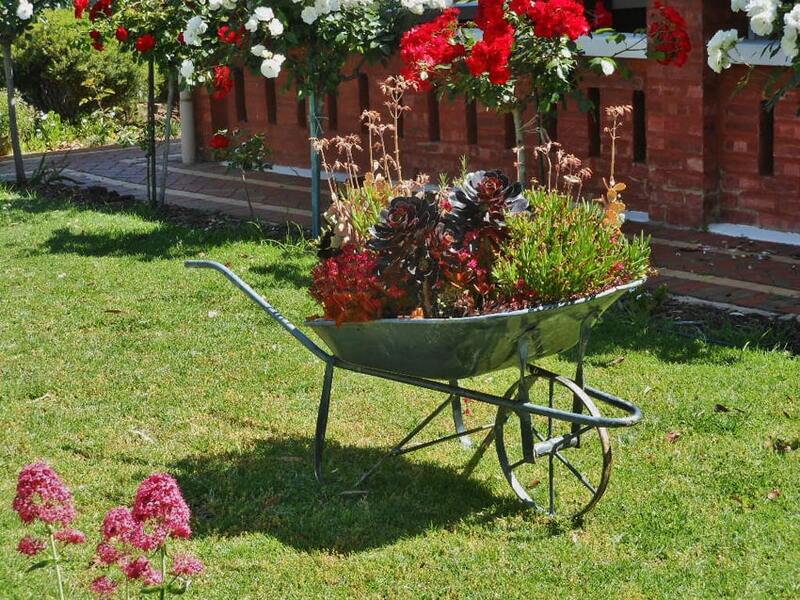 This example uses an old metal wheelbarrow in black as a small plant pot for a combination of flowers and shrubs. To give it an “aged’ look, some plants and weeds were planted underneath and around the wheelbarrow to make it look like it has been there for long. 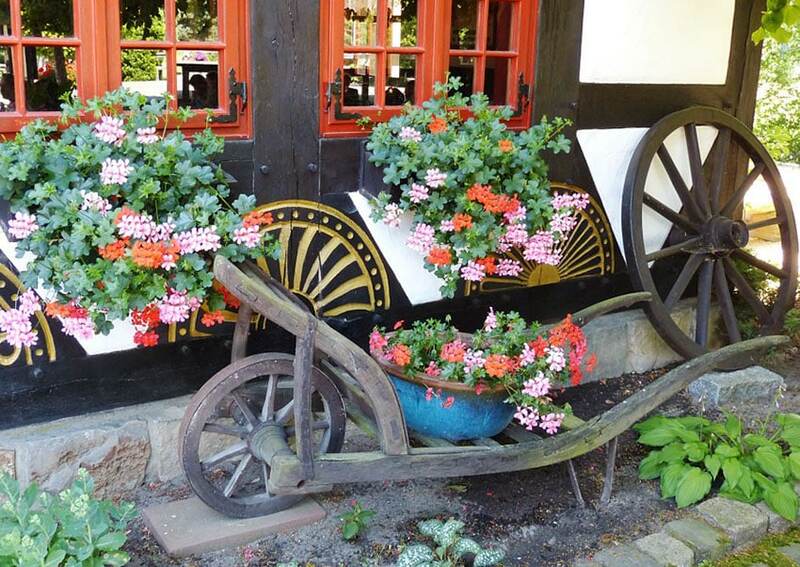 These are miniature wheelbarrows which were used a decorative plant pots for flowering plants. The old framing of the metal wheels were kept, while the the rubber tires were removed for a more rustic look. A discrete green-painted wooden wheelbarrow was placed on the side of this pond to serve as a plant pot holder. 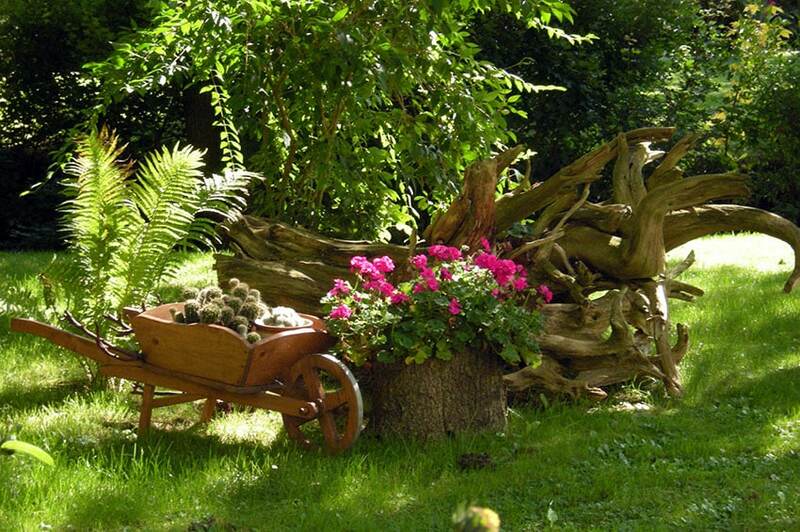 Inside the wooden wheelbarrow are tin plant pots for a very shabby chic look. 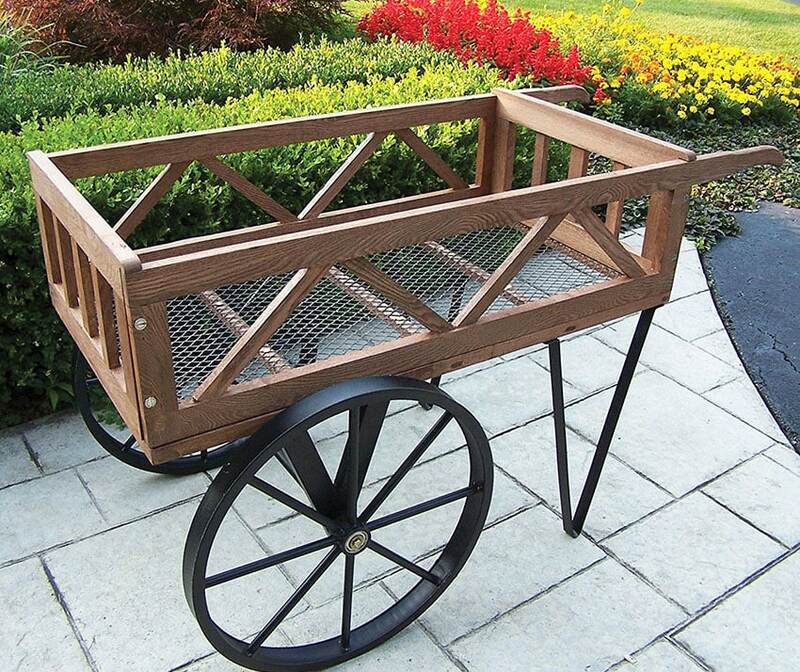 This small wood wheelbarrow is compact, making it easily transportable. Because of its small size you can fit it in any corner of your garden, or even place it by the entrance of your house. 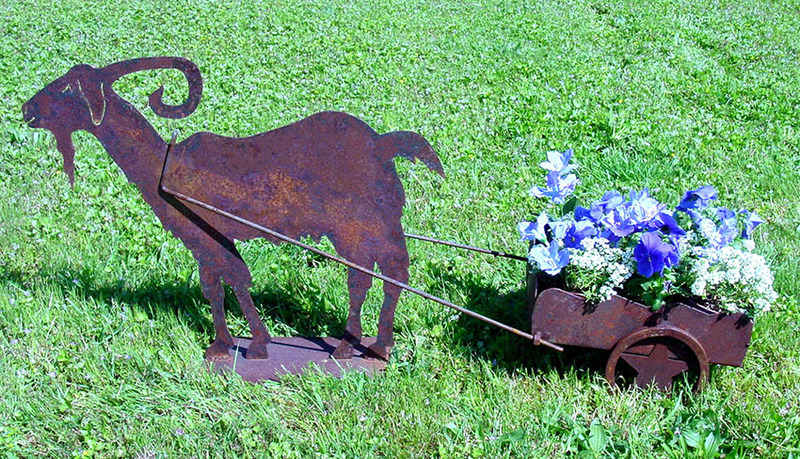 This example shoes a unique way to dress-up a common metal wheelbarrow. 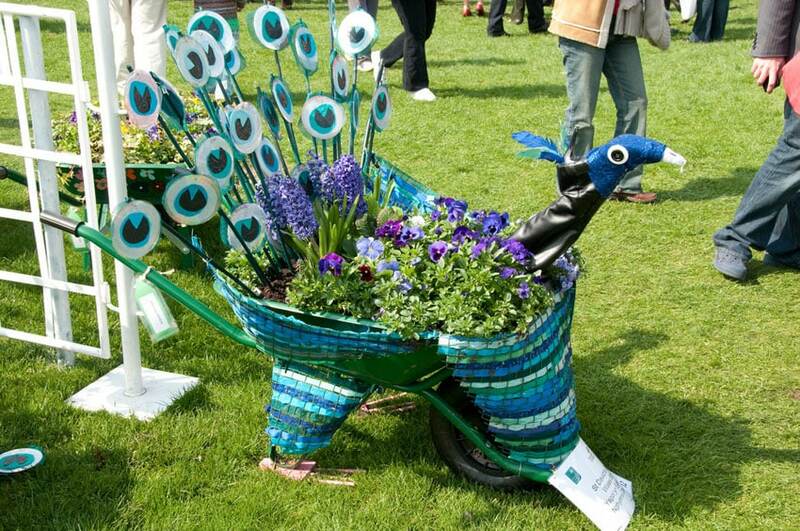 It uses weaved recycled plastic and other recycled items to make it look like a peacock, making it not only a functional flower planter, but also an installation art. Sometimes, simple is best, and this example shows that you don’t need to do anything fancy to make your wheelbarrow planter look good. 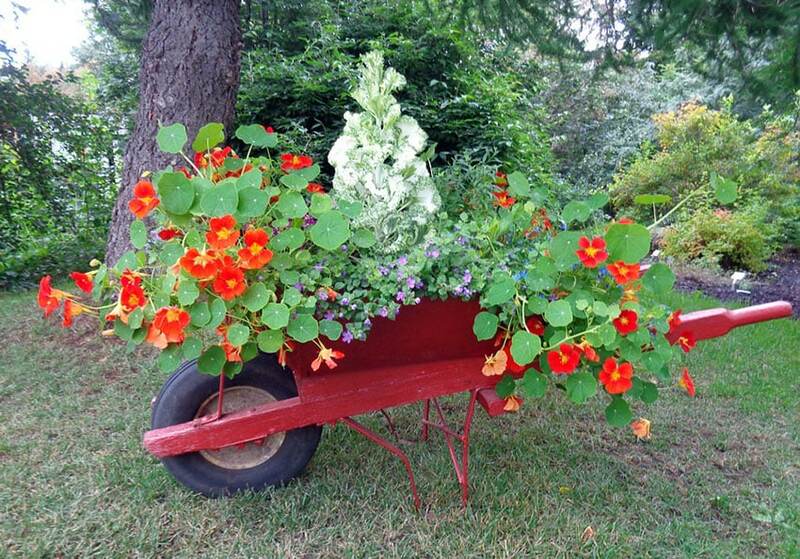 Just a plain old wheelbarrow, a nice plant arrangement with a nice red color scheme, and you’re done. 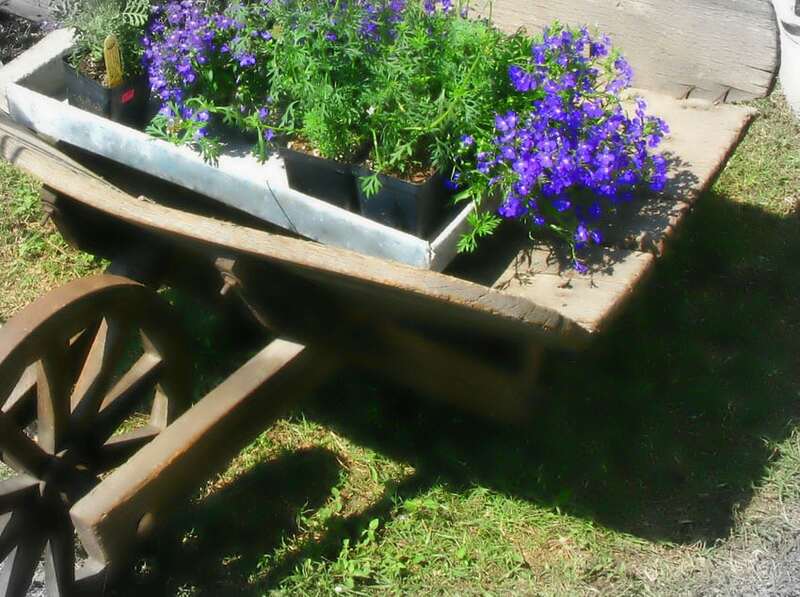 This old, dilapidated wheelbarrow has no side and back boards, so it was simply used as a stand to display the flower basket. This is a great idea for storefront displays using an old, wooden wheelbarrow. 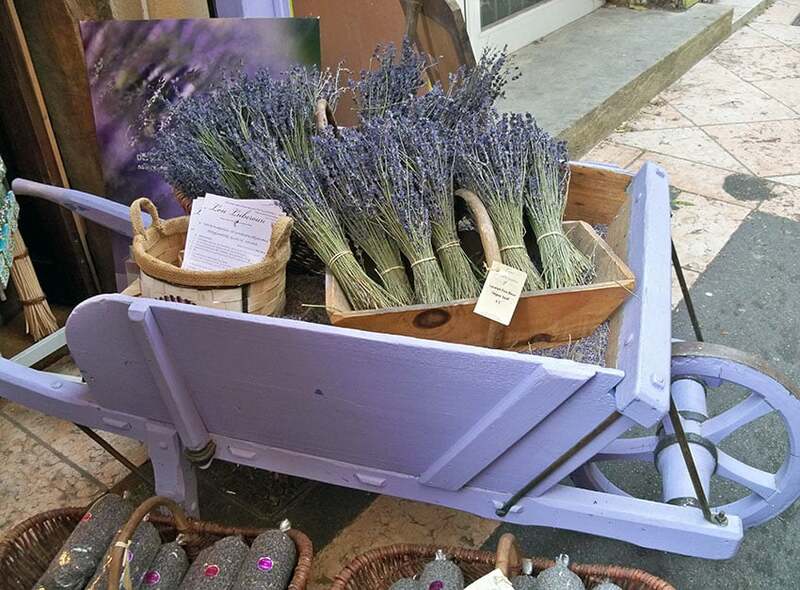 To match the lavender concept of the lavender flower display, the wheelbarrow was also painted in a lilac color, but keeping the finishing looking rough to maintain its shabby chic appeal. Another example of a salvaged wood wheelbarrow used a flowerpot stand. 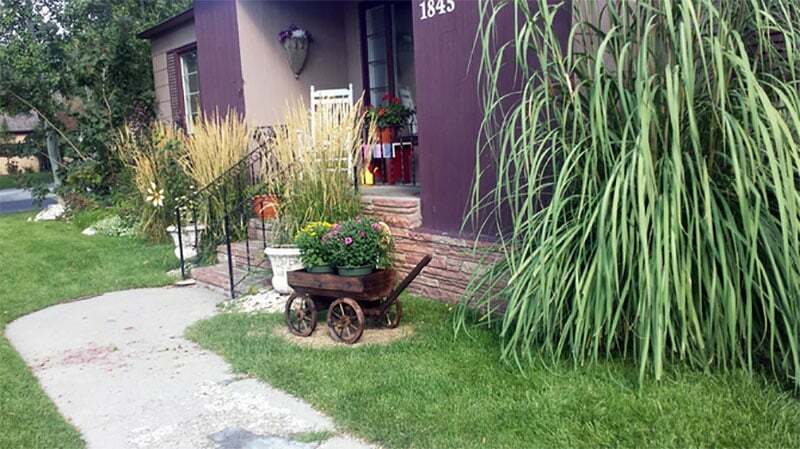 This wood wheelbarrow is used to promote a neighborhood antique store. The rustiness of this metal wheelbarrow simply adds to its charm, especially as an all wooden wheel was added to the composition. It gives a very antique, old-world feel. 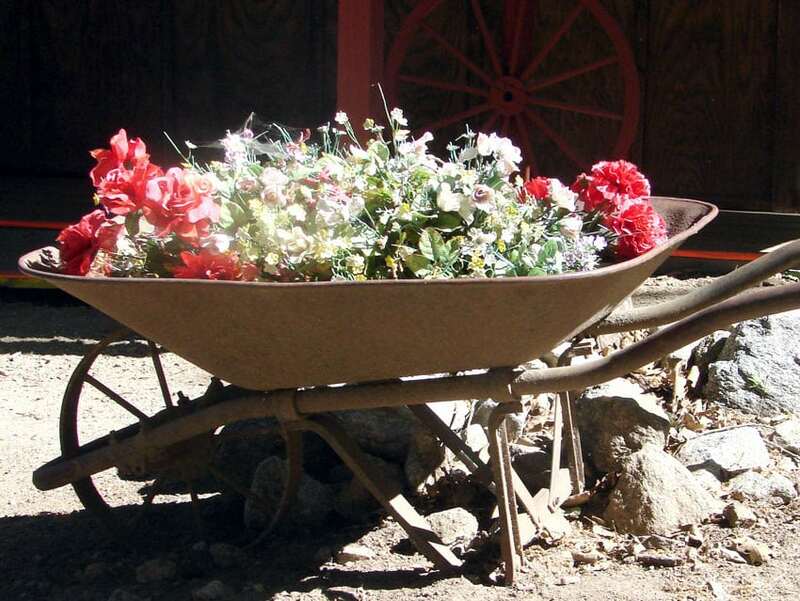 You do not have to do anything fancy to your old wheelbarrow, just like this example which keeps its old rusty surface, making the colorful flowers really stand out. 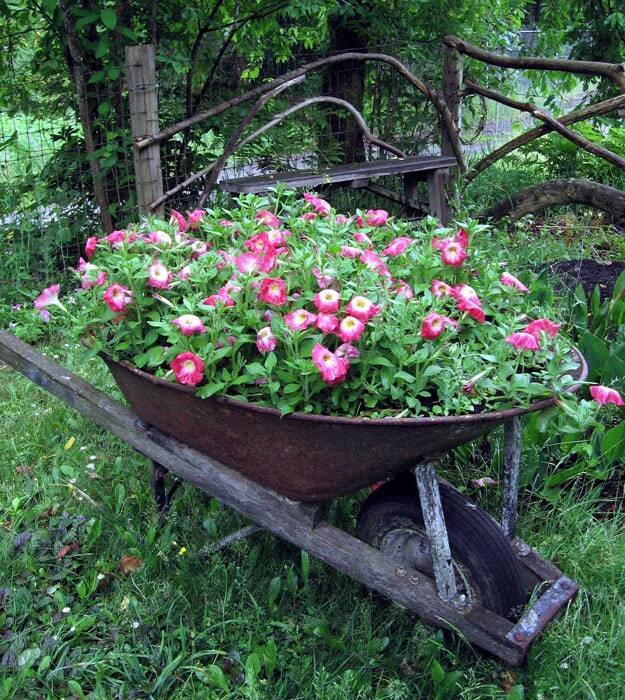 This is a very old wood & metal combination wheelbarrow which was planted with peonies, adding a charming look to the old wheelbarrow. This example shows how a metal tray was inserted into the uneven surface of the wood wheelbarrow to create an even surface for the plant pots to stand on. This is a very old style wheelbarrow that doesn’t have a “basin” so it was simply used as a stand for the large flower pot, adding more emphasis to the area. This is a very small metal wheelbarrow which did not really function as a wheelbarrow, but more as a decorative sculpture in the garden. This wooden wheelbarrow was definitely designed to be used as a decorative item as it has curves and accents unnecessary for a wheelbarrow, but adds more charm as a decorative item. This example uses it as a succulent planter. 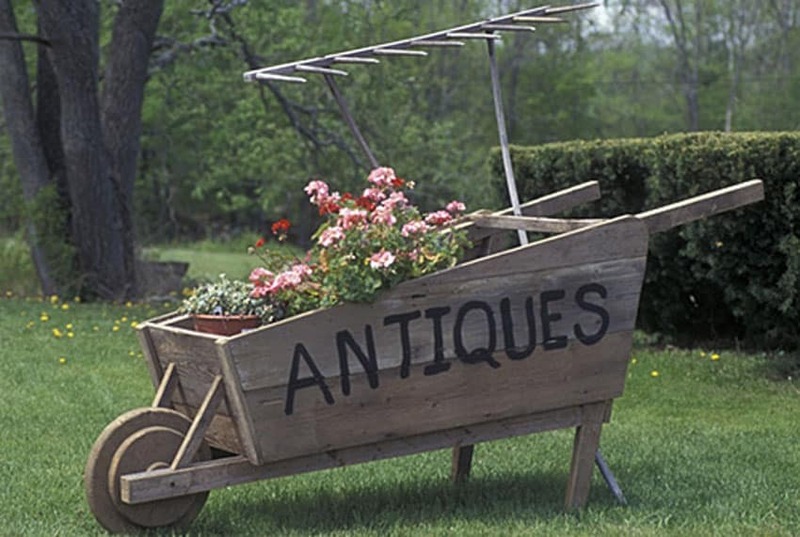 A small decorative four-wheeled wheelbarrow made of salvaged old wood and used as a plant pot holder. It was placed in a nice spot by the porch, making it a nice installation art feature in the front yard. This example shows a wooden four-wheeled cart. Because of its bigger size, it is able to hold more weight, therefore allowing more “levels”and plant varieties placed inside. This is a brand-new wheelbarrow design specifically for holding plant pots as you can see its mesh base design and its sturdy metal wheels and legs. It has a very clean & modern industrial look which would look great both indoors and outdoors. 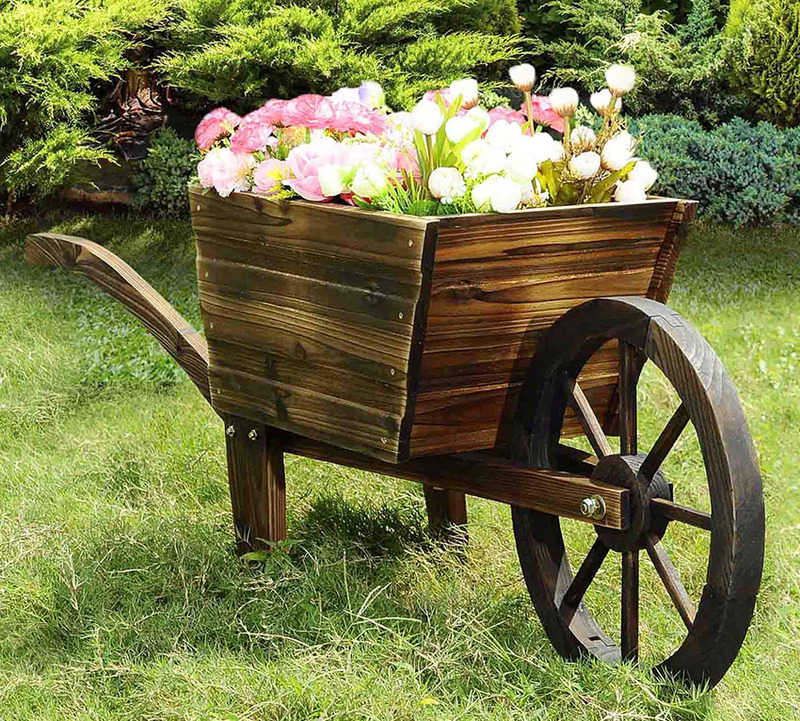 Functioning as a focal point of the garden, this wooden wheelbarrow has a rustic charm which also matches the light colors of the flowers as it uses light-colored wood. 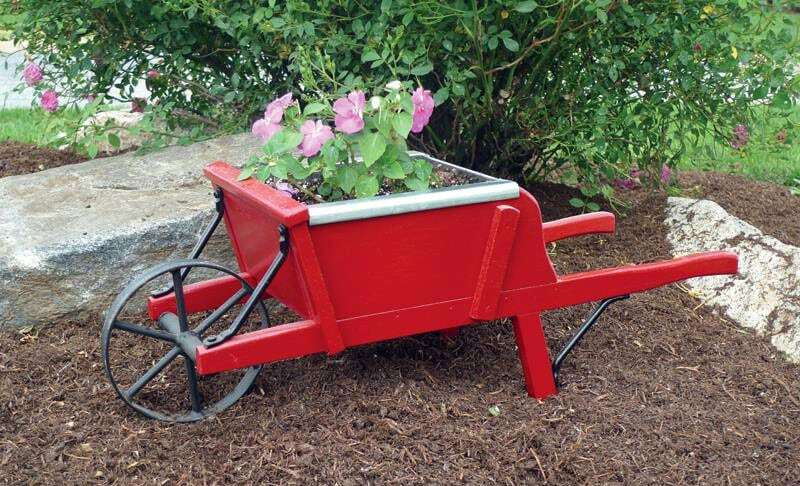 To match the bold red color of the flowers, the small wood wheelbarrow was also painted in red, making it really pop out from its background. With no side supports, this red and black cart simply functions as a stand for the plant pot, giving it more height and emphasis. 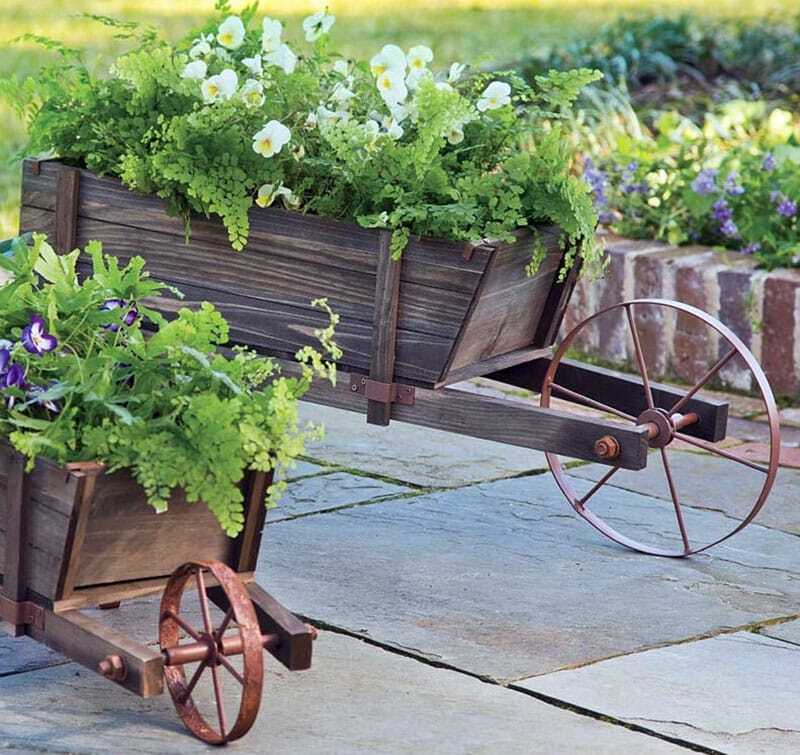 Using salvaged wood materials and metal, this small wheelbarrow planter with metal plant-holder was made. It was painted in red and placed in a conspicuous location to make it stand-out. Source your wheelbarrow – a defunct wheelbarrow from your garage, or those bought or salvaged from junkyards can be used for this purpose. Determine the look you want to achieve to help you decide the type of wheelbarrow to use. Wood wheelbarrows often have an open back portion (near the handles) so you have to board it up first to be able to use it. Create drainage holes – flip over your wheelbarrow and create holes for water drainage. A 3/4″ hole is an ideal size and would allow excess water to drip out to keep your plants alive. Add wire mesh – a fine wire mesh should be attached to the bottom of the wheel barrow to cover the holes made for drainage to keep the soil from spilling out of the drainage holes. Make sure the size of the wire mesh would still allow water to pass through, but is fine enough to keep your soil in place. Select a location – before filling your wheelbarrow, it is better to decide where to put it and place it there as it would be difficult to haul it once it is filled. Find the perfect spot in your garden, front yard or backyard and compose it according to the look you want to achieve with your wheelbarrow planter. Fill it with soil or potting mix – depending on your preference and the type of plants you intend to plant in your wheelbarrow, you can fill your wheelbarrow until around 1″ from the top with your soil mixture or potting mix of choice. Always keep in mind to consider the type of plant you will be planting to determine the perfect mixture and keep your plants healthy. 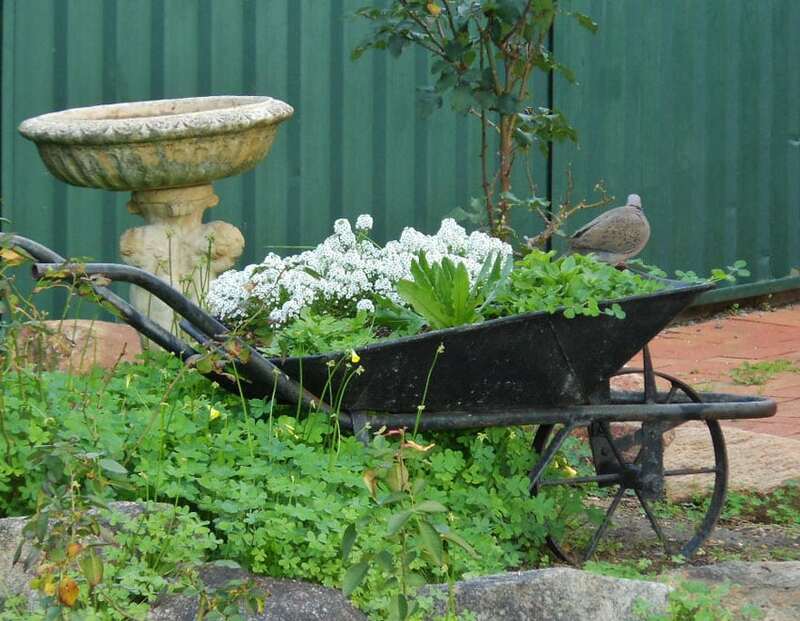 Start Planting – you can start planting your flowers, vegetables or even succulents on your wheelbarrow planter, making sure to use the appropriate planting technique needed. There are so many plant varieties you can choose from depending on your preference. Add mulch – add the appropriate layer of mulch according to the plant you have placed in your planter to keep the moisture in. Aside from this, you can also paint your wheelbarrow prior to filling it with soil if you want to achieve a specific look or adhere to a specific color scheme. You can also add other decorative materials on the surface of the wheelbarrow planter – the possibilities are endless and your only boundary is your imagination. Whether you’re adding a rustic charm to your garden or a more modern touch, both can be achieved by giving new life to an old wheelbarrow.